Editor’s Note: This story is also appearing on Linux.com. 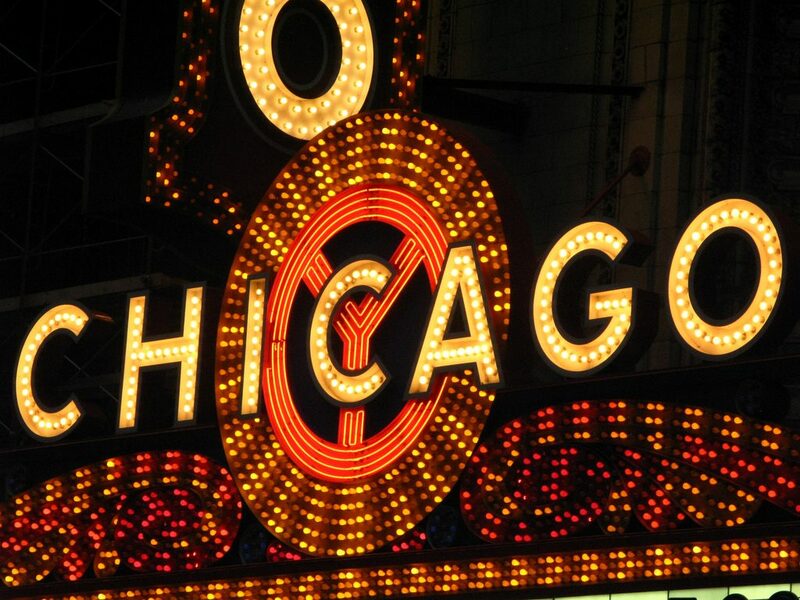 OpenStack is the most popular open source cloud project, followed by Docker and KVM, according to a survey of more than 550 respondents conducted by Linux.com and The New Stack and announced today at CloudOpen in Chicago. The results reflect the rising popularity of a new generation of open source projects that for the most part are less than five years old and aimed at meeting the growing enterprise demand for cloud computing infrastructure. In turn, these young projects are showing favor but the strength of the more solid technologies have a certain degree of longevity that is also reflected in the results. 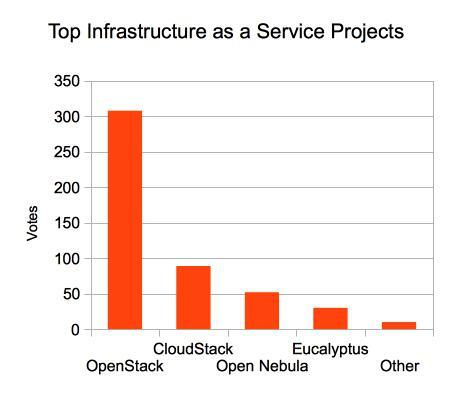 OpenStack was the most popular choice with 389 points (72 first, 68 second, and 37 third choice votes). Docker received 284 total weighted points, making it second best overall. KVM had 212 points, making it the third most popular open source project. OpenStack had the most contributors weighing in on the survey and has been growing quickly. Fewer respondents said they contribute to Docker but it’s the project everyone said they want to contribute to more. These are hot projects. The totals show the strength of such newer projects. OpenStack is the open source cloud software project started four years ago. Docker is less than two years old but has already established itself as one of the fastest growing open source projects of all time. 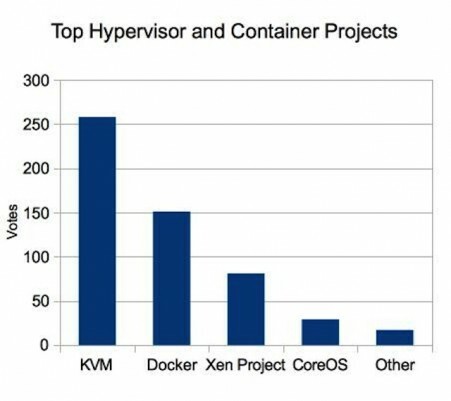 In the hypervisor category, KVM received 48 percent of the vote, followed by Docker with 28 percent. It is interesting to note that Docker was chosen by more respondents than Xen, which received 15 percent of the vote. Xen is an established hypervisor used in some of the world’s largest and most sophisticated cloud services. Docker, in contrast, is less than two years old but has seemed to carry enough influence to make it one of the most important open source projects of the past 20 years. OpenStack was the clear favorite among IaaS platforms with 63 percent of the vote, followed by Apache CloudStack with 18 percent. Among PaaS platforms, OpenShift was the clear winner with about 54 percent of respondents choosing it over CloudFoundry which had about 36 percent of the vote. Respondents were also given an option to list their platform of choice not listed under ‘other’ category. Among IaaS platforms, there were a handful of platforms different from the four choices provided (OpenStack, CloudStack, OpenNebula & Eucalyptus), making up about 2 percent among total responses. 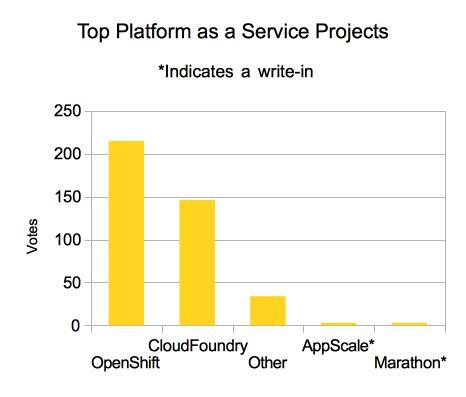 Among PaaS platforms, write-in alternatives to OpenShift and Cloud Foundry made up to 10 percent of responses, though not all were open source projects. For example, Marathon and AppScale were two write-ins listed multiple times. Heroku was also commonly mentioned but it’s not open source. Both OpenShift and Cloud Foundry reflect the market’s immaturity. Developers are starting to use PaaS these two offerings are dominated by large enterprise companies. The real change may come with a new breed of PaaS providers that are using Docker, namely, they’re open source and designed to let users run their own PaaS. This indicates a still-early stage of PaaS platforms, with clear indication towards the dominant two platforms. Puppet had 23 percent of the vote and was rated the most popular provisioning/ management tool, followed by Ansible with 18 percent. Salt Stack received 13.3 percent of the votes cast and JuJu squeaked past Chef with 10.7 percent compared to Chef with 10.4 percent. Ansible and Salt Stack’s strong showing illustrate the demand for a higher level of automation in cloud scale environments, compared to the more traditional configuration management systems. Ceph led the storage category with 49.6 percent of the vote. Gluster came in second with 20 percent and Swift had 17 percent of the vote cast. Riak CS from Basho had 10.2 percent of the vote. Unsurprisingly, the quality of the community and openness were rated the most important deciding factors in choosing the open source projects for each category. Each of these factors received 55.3 percent of the vote. Performance with 51.6 percent and security with 50 percent were rated as the next most important factors. Flexibility had 49 percent, relevancy had 45 percent, and maturity of a project played a factor in 43 percent of the vote, while size of the code base received 36 percent, reflecting the desire not just for trust but for richness of the project, too. Interestingly, 27 percent of the respondents said they do not contribute to open cloud projects, which may reflect the fact that most participants in these projects represent their companies as a voting block. They represent a powerful part of the open source community but are smaller overall in terms of the total number of participants. Among the respondents, OpenStack had the most contributors, with 17.2 percent of respondents saying they contribute, followed by CloudStack with 12 percent of respondents contributing. OpenStack also saw the greatest use, with 13 percent of respondents choosing it as the project they work with the most, followed by KVM (10.5 percent) and OpenShift (7.3 percent). Approximately 47 percent of the voters cited poor documentation as the biggest challenge that contributors face while deploying the projects they use the most. In second with 38.8 percent, voters said complex installation steps posed the biggest challenge, followed by difficult configuration management with 22.7 percent of the vote. Github is the most popular development platform, with about 67 percent of respondents using it. Text editors are still a rage, with 60 percent of respondents making use of them, while only about 32 percent use full-fledged development platforms. A sad 3 percent of respondents don’t use any source control mechanism at all! Docker is the open source project that most respondents said they would like to contribute to, with 21 percent responding, indicating the popularity of the Docker open source project. Among the contributors, about 42.5 percent were independent contributors. 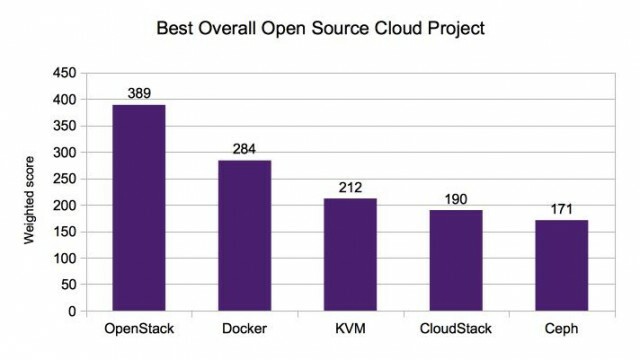 Survey results illustrate that OpenStack and Docker are clear winners of mindshare among open source cloud projects. The results also emphasize the need for correct and valid documentation, along with easier deployment options. Finally, they also show a non-trivial percentage of independent contributors making an impact. OpenStack and Docker will continue to dominate the open source cloud discussion. But Docker may prove to gain the most as it is also breeding a diverse ecosystem of open source projects. OpenStack is primarily contained (no pun intended) to the development of its own cloud operating system. It does integrate with OpenShift, for example, but for the most part the different groups within OpenStack do the lion’s share of development. Docker’s influence is such that it is affecting the overall open source community. The projects that are closely tied to Docker, such as Ansible, will continue to grow as developers seek tools to use with the fast growing container technology.